Four Months Until the Big Day for Sarah & Nathan! 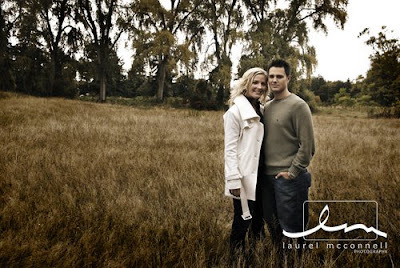 Sarah and Nathan are tying the knot on July 26, 2008 – their ceremony will be at St. James Cathedral and reception to follow at the gorgeous Benaroya Hall. 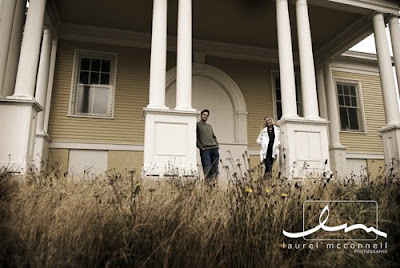 As we are quickly approaching their big day, I thought it would be fun to share a few of their plans, highlight their vendors, and showcase a few of their fabulous engagement pictures from none other than the incredible Laurel McConnell. These pictures were taken at Discovery Park during their “Getting to Know You Shoot”. Fun fact about the couple – they have known each other for 18 years as they met in 1990 in their 1st grade classroom! Sarah just showed me their class picture and they are just too cute! As we are in the final stages of the planning process, one of the last things that was on our to-do list was to sample the catering and to finalize their menu. We recently got together at Benaroya to taste the exquisite items prepared by one of Wolfgang’s head chefs. Here are a few of the yummy things we sampled – some of the tastiest food in Seattle, if you ask me! 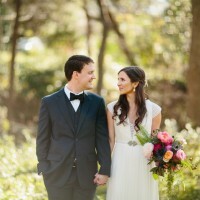 As for the decor, Sarah envisions her wedding to be extremely elegant, romantic, and all with a bit of vintage flair. 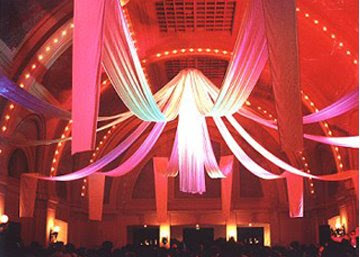 Since Benaroya Hall is nearly all glass, we needed to bring in design elements that would help to soften the room a bit. They decided on a lush, white fabric “chandelier” similar to the image below, which will be draped from the ceiling, embedded with twinkle lights, and the fabric will cascade downwards. Here are a few of the amazing vendors that they have selected to be on their team! We’re all going to have so much fun- Sarah, Nathan, and their families are just so sweet. Thanks for being their superstar planner Kelly!!!! I have no doubt that the day will run smooooth as butter!! 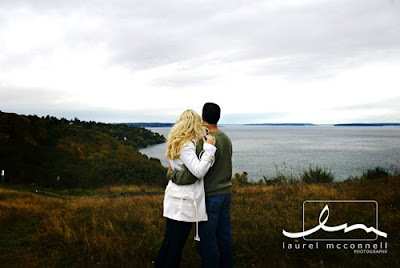 Great photos by Laurel, she is such a sweetie! Looks like it’s going to be BEAUTIFUL. Love the fabric chandelier! I meant to comment earlier! I can’t wait for Sarah & Nathan’s wedding! It is going to be so much fun!